No. of jar : 5 Speed Setting : 3 Power : 550 Watts Body material : ABS Body No. 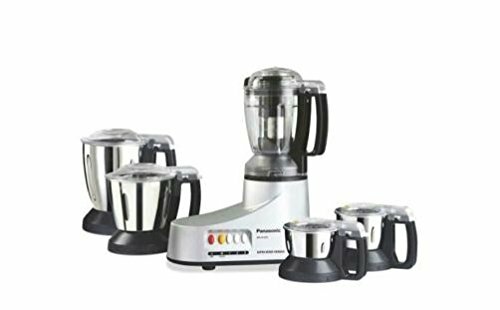 Of attachment : 5 Type : Double Locking system Color : Silver Black, Comes with 5 Jars- Unbreakable Polycarbonate Juicer Jar, Stainless Steel Blender Jar, Stainless Steel Mill Jar, Stainless Steel Multi Jar and Stainless Steel Chutney Jar, 550 Watts Heavy Duty Long Lasting Motor, Double safety Locking System, Unique Inter Locking System, Hardened Stainless Steel Blades for maximum grinding efficiency, Original Oil Seal Protection System, Flow Breaker Jar, Juice Extractor, Circuit Breaker System, Piano Type Button Switches, Prevents Accidents. To Recieve updates and possible rewards for Panasonic MX-AC555 please sign in. To Recieve updates and possible rewards for Juicer Mixer Grinder (JMG) please sign in.